I was 63.5 miles into the Bighorn Trail Run 100 Mile and I had just stumbled into the Cow Camp Aid Station and was talking to one of the race medics. About a mile back up the trail, I slipped and fell, striking my head directly on a large rock. For a moment I felt woozy, saw stars, and had a buzzing in my ears. The guys I was with, Tony and Dave, helped me to my feet and asked me how I was doing. “Are you serious?” Tony said. From there, we walked to the aid station where it was decided that I would be held at the aid station for an hour before being allowed to continue. 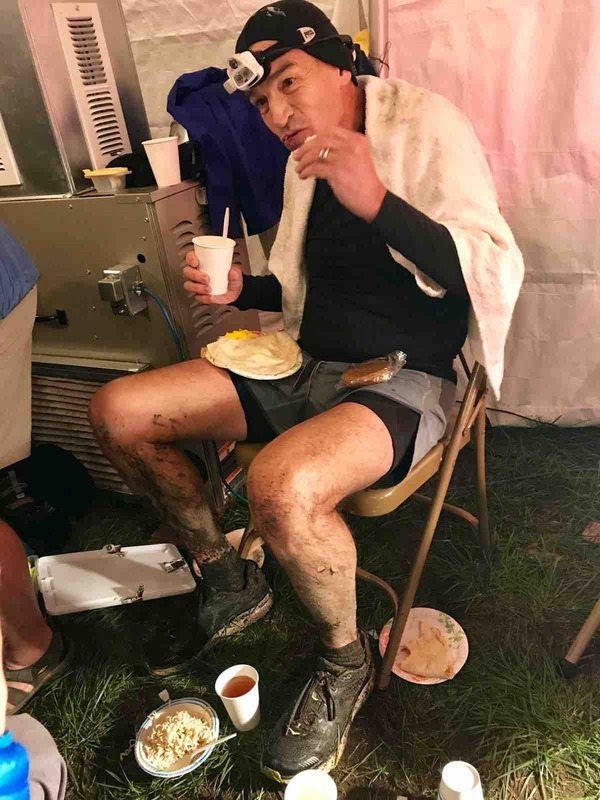 It was clear to everyone that I had sustained a concussion, thankfully, the first one of my life and a very new ultramarathon experience for me. The Bighorn 100 had started hours earlier in excellent conditions. Sixty degrees Fahrenheit, partly cloudy skies, light winds, and generally dry trails. For the first 30 miles, I moved along well, enjoying the remote beauty of the Wyoming mountains and taking in the day. I arrived at Sally’s Footbridge Aid Station at mile 30 in about 6 hours, 30 minutes, and feeling happy and comfortable. From there, the race course ramps up with an 18-mile, 5,000-foot climb up to the turnaround point. It was in the midst of this climb that it began to rain. At first it was a light drizzle, but gradually the rain fell harder and the trails became slick. 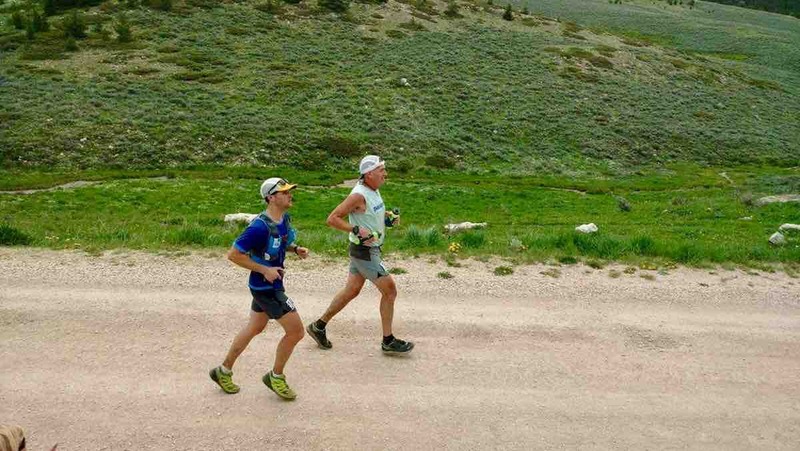 At one point about halfway up the climb, while running with old friend and seasoned ultrarunner Ian Torrence, he quipped, “This crap is slicker than snot on a doorknob.” That turned out to be a gross understatement. As I made my way up to the turnaround, I put on more and more clothes and by the time I arrived at the turnaround in the dark, soaking wet and cold, I was wearing everything I had. The scene in the aid-station tent was like something out of a David Lynch movie. There were probably 50 runners, pacers, crews, and volunteers packed into a tent the size of a typical American kitchen. Slumped in metal folding chairs and huddled by space heaters, most of the runners looked dazed. On a table in the corner, a stack of bibs was gradually growing as many just walked into the tent, ripped off their numbers, and dropped. Jason Koop, my crew, grabbed me a bunch of food and I started wolfing down a quesadilla with cheese and bacon, mashed potatoes, Ramen noodles, and an Oatmeal Cream Pie. (Thanks John Fitzgerald!) After about 15 minutes, I summoned the will to get back out there and begin the slog back to the finish line in the town of Dayton. As I made my way down the first few miles after the aid station, the words of Dr. Thomas Gross, my hip surgeon, began to echo in my head, “With this surgery, it is wise to avoid running on slippery surfaces whenever possible as that can cause significant discomfort in the compromised muscles around the joint.” Well, one thing’s for sure, I was certainly not being wise! And so it was about two thirds of the way down the muddy slip-and-slide that the trail had become that I fell and banged my head. Sitting by the campfire, bundled in blankets, and waiting for the hour to pass before I could go on, I wondered about continuing. I knew I wanted to forge on as there was plenty of time and with the coming sunrise I would be sure to find renewed energy, but I also felt some fear creeping in. What if I fell again? What if I didn’t have all my mental faculties? What if I got off course? I shoved those feelings aside, however, when the medic came over, asked me a series of questions, and gave me clearance to continue. He told me that he was requiring me to run with a group to the next aid station where another medic would evaluate me again and then, if things were clear, I could proceed as I wished. On that final descent to the Footbridge Aid Station, the sky lightened a bit but the mud and rain were relentless. Sitting there, 66 miles into Bighorn, it became clear to me that this was more of a survival contest than a race as these were most certainly the most difficult trail conditions I had ever encountered. Perhaps the best thing that Bighorn did this year was force runners to buddy up and share the experience. Over those last 34 miles, I shared the trail with many others who, like myself, had simply resolved to plod on. There was nothing glamorous or even all that fun about those last miles, but the shared suffering and profound adversity somehow made it more rewarding. By the time the trail ultimately and mercifully spilled out onto the last five-mile stretch of dirt road, the skies cleared and the sun came out. It was a rather cruel end to a truly gut-wrenching day. In the days since the race, I have continued to monitor my condition and have received great medical advice in caring for my concussion. And, while I still feel slightly off, I feel okay with my decision to continue and finish the race. It was, of course, by no means my best 100-mile effort, but in many ways it was one of my most satisfying. Even after 25 years and 34 one-hundred-mile races, this sport finds ways to stretch me, open me up, and give me the chance to experience life in ways that nothing else really does. And for that I am truly grateful. This week’s Beer of the Week comes from Knee Deep Brewing Company in Auburn, California. 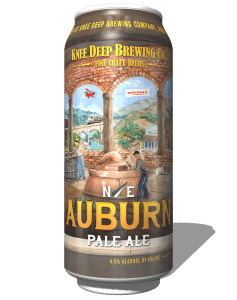 Known for their richly hopped IPAs, Knee Deep features a simple and tasty pale ale called Northeast Auburn Pale Ale. Juicy and fruity, N/E Pale Ale is a crisp, clean pale ale that is wonderfully drinkable. When was the last time you had a race or adventure go awry because of changing weather or bad weather at the outset? In situations like this one, how did you adapt your mental and physical strategies to let goal of your initial performance goals and make it to the finish? Just for clarification, sounds like you got the head whacking just above Cathedral Rock Aid Station. Cow Camp is about 10 miles up the hill beyond Sally’s Footbridge. Thankfully, I opted for the 52 miler this year. I certainly did not appreciate how you 100 milers muddied and mired up the trail for us! Seriously though, I was in awe at the tough grit shown by those who traversed that mess twice. I too fell and hit a rock. It was early on in the race, about four miles from the start. It knocked the wind out of me, severely bruising or cracking my sternum. My only thought was to get up, get going, and finish. Sometimes ya gotta wonder about the mindset of ultra runners! I ran the 52 mile race a few years ago and the night before they had similar but not as bad of a storm go through. I have to say that the first 18 miles to Footbridge was some of the muddiest conditions I have ever tried to run in. My hat is off to you and anyone else that managed to finish that race. During my race I lost one of my shoes and had to dig around in the mud to get it back but you know you never forget the tough ones! Cheers! That was my first 100 miler and I, quite honestly, can’t believe anyone finished it in the allotted time. Getting up the wall when it was all slicked up like that was a soul crusher. Luckily I didn’t have any expectations or goals for time so I wasn’t disappointed when it turned out to be slow going in the middle. All you could do is laugh at the ridiculousness of it all. 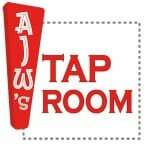 I’m glad you’re OK, AJW. AJW- I remember meeting you in the middle of the night at Cathedral Rock and running with you to Footbridge. That was an incredible adventure for sure and I’m so glad you both finished and are doing well. It was a race none of us will ever forget. In fact, I even felt compelled to write my first ever blog cataloging the journey! trying again: sounds like similar conditions to Black Canyon only worse! congrats on finishing what must have been tough. are those cliftons or challengers? at BC I wore road shoes and even though the wet clay was super slippery it seemed like everyone was sliding equally whether they had lugs or not…in fact I was glad to not have the extra couple of pounds of mud on each foot to lift each step. Wow what a adventure that was. I was volunteering at the Cathedral Rock Aid station for the whole race. I remember you coming into camp.